SADDLER is the quintessentially British Leather Goods Brand that traces its heritage back more than 25 years. Every SADDLER piece combines the finest leathers handcrafted by experienced artisans employing traditional leather skills with creative design and eye-catching colour that makes any SADDLER piece an ideal real leather gift. The SADDLER Essence Collection bears all the hallmarks of excellence across a comprehensive range of ladies accessories destined to impress those with the most discerning tastes. The outer flap of each piece is distinctively embossed with the SADDLER logo and the interior is lined with SADDLER monogrammed woven jacquard lining. High quality fittings are used to enhance the natural beauty of these full grain cowhide wallets and, as a finishing touch, the Saddler Essence range is delivered to you in its own innovative gift packaging. 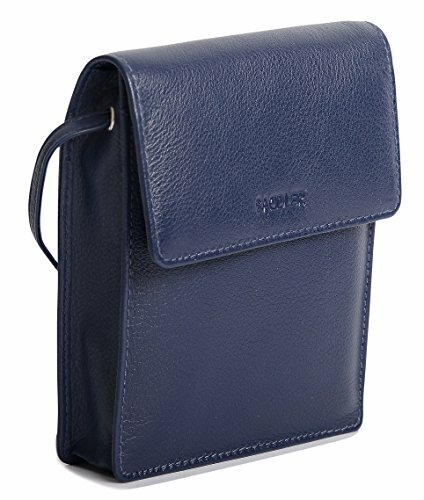 This flapover cross body travel pouch for passports & credit cards has been created for the stylish traveller. The front flap is secured with an adjustable snap button opens to reveal roomy main compartment, to the front is a 12cm slip in pocket and to the rear is a full length 16cm slip in pocket for added security. This pouch comes with a removable 6 card section for airline mileage cards & credit cards. On the outer backside is a zipper secured slip in pocket. Comes with an adjustable crossbody strap with a 77cm centre drop. Approximate Size 15.0cm x 11.5cm x 3.5cm and weighs approximately 125 grams empty. If you have any questions about this product by Saddler, contact us by completing and submitting the form below. If you are looking for a specif part number, please include it with your message.